Unique creative and custom one-of-a-kind gifts! Business gifts branded with your logo for your favorite clients, holiday gifts, thank you gifts and more! Industry themed gifts that are tasty and delicious made special, just for your company and industry. Call The Gift Planner today at (602) 526-0963! Get in the zone with a delicious chocolate gourmet construction themed safety traffic cone. 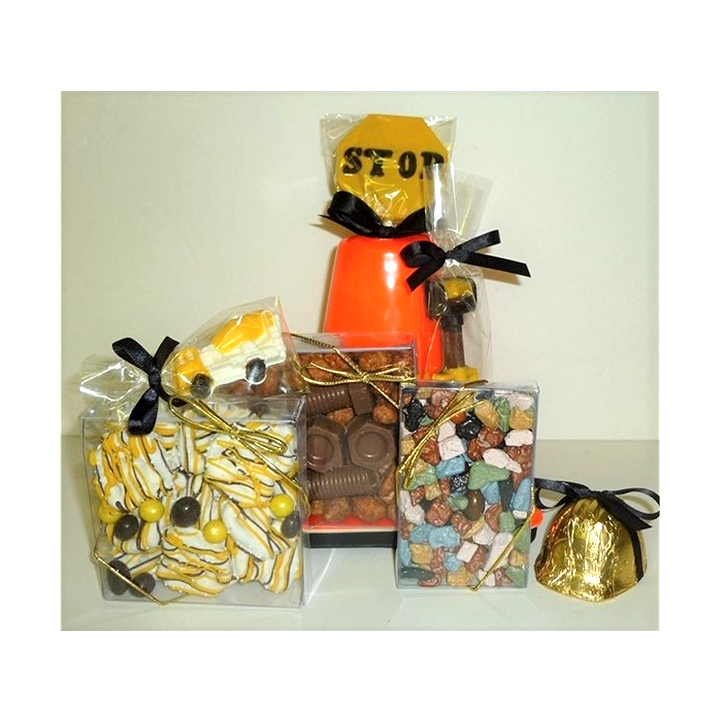 Comes with a 6 inch base x 6 inch high traffic safety cone, dipped pretzel box, nuts and bolts box, chocolate rocks box, foiled chocolate hard hat, cement OR dump truck, chocolate stop sign and chocolate shovel. 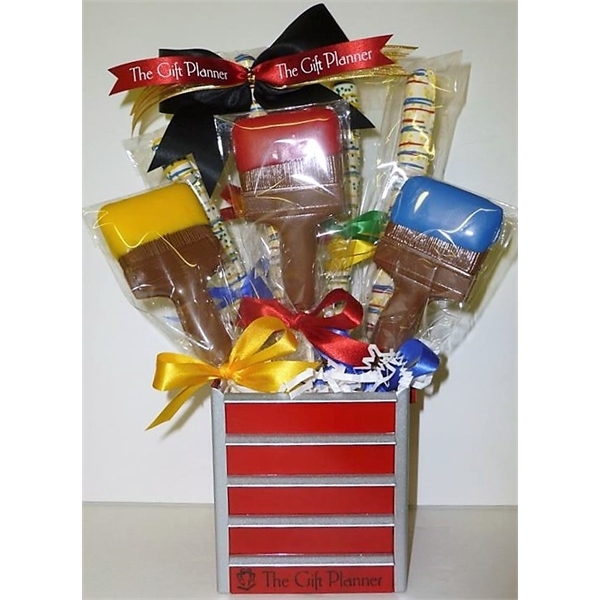 This adorable construction themed gift can have caution ribbon or imprinted ribbon in your choice of color. Wrapped in cello and tied with bow. Choose your bow, ribbon and edible decoration colors to match your corporate colors. This delicious and adorable gift basket makes a perfect holiday gift, thank you gift or client gift. Various imprinting options that best highlight your logo and company! 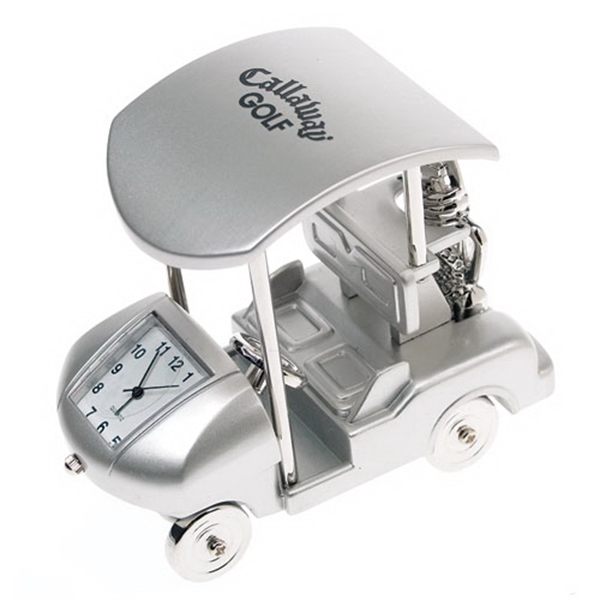 Hit a hole in one at your next promotional event with this metal golf cart clock! Ideal for country clubs, golf outings and fundraisers alike, this item can be customized to your specifications for a promotion bound to impress recipients. Ideally suited for any desk or shelf, keep your event or promotion in the minds of your valued guests and clients with this one of a kind product. Inject your website with more hits with our Syringe Web Key. 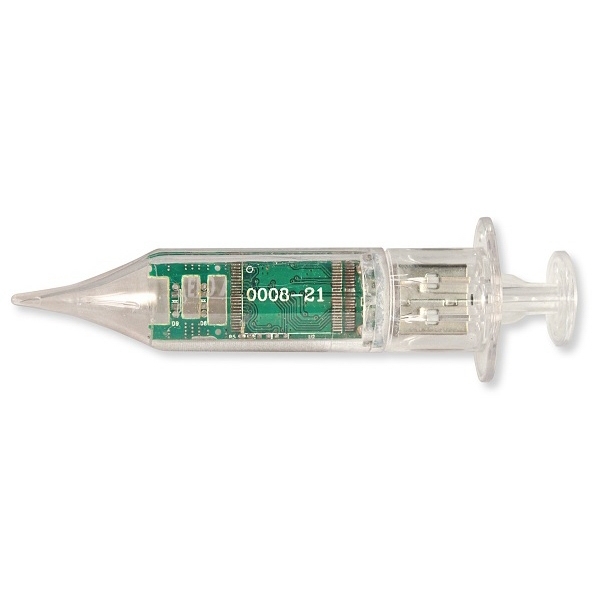 This unique web key is shaped like a syringe and is a great promotional product for hospitals and pharmaceutical companies. This web key will automatically launch your website in any browser when plugged into a USB port, ensuring that your message will be in front of potential clients. Plus, these distinctive web keys can be silkscreened with your logo for further customization. Miniature coin safe 4.25 x 4.5 deep x 6 high. 24 gauge cold rolled steel. Features a coin slot, a three number combination lock and models old antique safes in design. Powder coated ensuring long lasting durability. Filled with 2 money themed treat boxes wrapped in dollar sign pattern cello. First box filled with 12 mini dark chocolate mint flavored Oreo cookies with 1 milk chocolate foil dollar sign and 3 gold foiled milk chocolate coins. Milk chocolate candy coated "pearls" for filler (12 pearls). 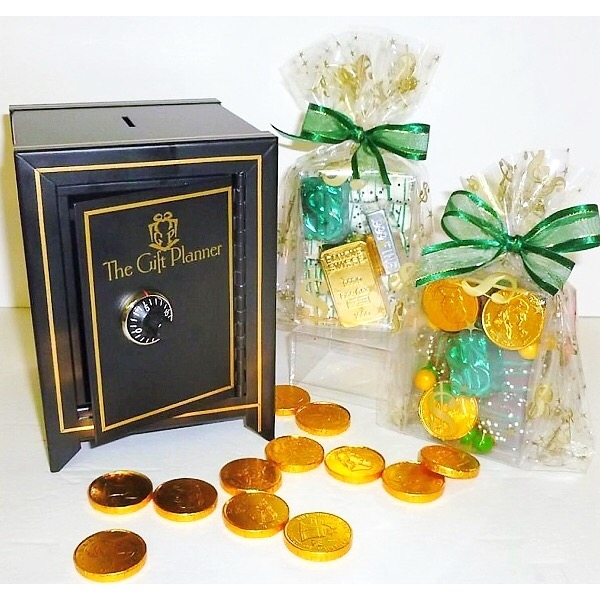 Second box filled with 10 mini white chocolate dipped pretzel logs packaged with 1 gold foiled chocolate gold bar, 1 silver foiled .999 fine silver bar and 1 green foiled milk chocolate dollar sign. 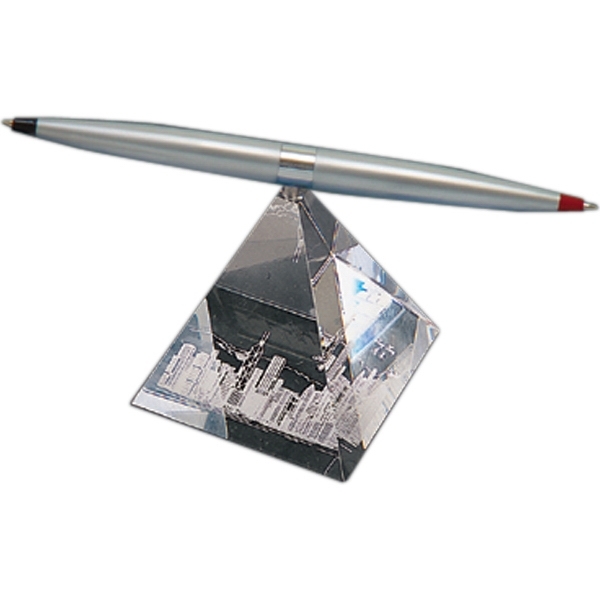 The helicopter pen with crystal base is a promotional product that is unique yet functional! This one-of-a-kind crystal pyramid features a floating and spinning satin chrome pen on its tip. A wonderful decision maker! All sides are engraveable; however, engraving on the base of the pyramid provides for a sleeker look. A great gift or giveaway piece, add a special message and feature this executive toy at your next event. A unique real mechanics toolbox pencil cup made of 24 gauge cold rolled steel and measures 4" x 3.25" x 3.25". Filled with 4 dipped and drizzled pretzel rods and 3 large chocolate paint brushes. Choose your color imprinted ribbon and your edible decoration colors. Perfect for Painters and Painting Industry. 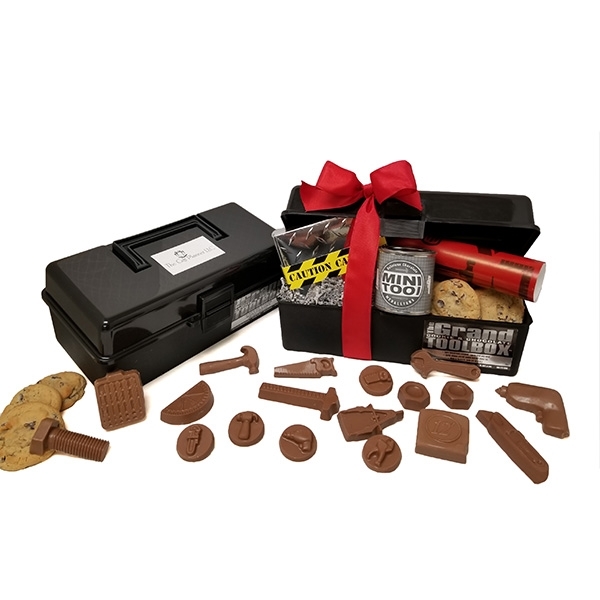 A contractor themed black toolbox filled with chocolate tools of the trade, diamond plate toolbox with milk chocolate drills, drill bits, hammers, saws and wrenches, mini tool medallions, tape measures and more! A large selection of gourmet cookies and chocolate to represent the construction, builder and contractor industry! Toolbox ships open just like a gift basket so you can better believe your recipient will say WOW! Toolbox measures 13 inches x 6 inches x 5 inches. Everybody needs a little black toolbox! Shop More One of a Kind Gifts!